For the past eight years, our economy has been growing constantly, more jobs have been created and poverty has dropped. This was found by a study of the Policy Co-ordination and Advisory Services (PCAS) in the Office of the President. The study also found that the country is likely to meet the targets of the Accelerated and Shared Growth Initiative for South Africa. These targets include halving unemployment, creating jobs and growing the economy by six per cent by 2014. Just like we have to manage our money and make it grow to improve our families’ lives, our government also has to manage its finances to improve the lives of the country’s people. The PCAS study was done to find out if government is reaching its targets of growing the economy and putting into practice its social and development programmes. It gives government a broad picture of its overall progress and the challenges it faces. This helps government to plan better and improve its performance to benefit the people. The study was done in line with 10 broad themes. These included economic growth and transformation, employment trends, poverty and inequality, health, education and social cohesion. Black participation in the economy has improved, but it needs to grow even more. More black people have moved from the Second to the First Economy since 2000. The number of people earning less than R3 000 per year has dropped from 50 per cent to 43 per cent. Since 1994, about 2,3 million houses that are financially supported by government have been completed or are in progress. A total of 85 per cent (9,5 million) of households have access to water. About 71 per cent (9 million) of households have access to sanitation (toilet facilities). About 9,5 million households had access to electricity in 2006, compared to 4,4 million in 1995. Cases of TB increased since 2001 and drug-resistant TB has appeared. The number of matric learners passing higher-grade maths has grown from 19 504 in 2001 to 33 112 in 2006. Adult literacy has grown from 69,6 per cent in 1995 to 74,2 per cent in 2005. Tourism has been growing fast since 1994. This is helping to create more jobs. South Africa is now among the top six countries regarding openness in budgeting. Most people are happy and confident about the country’s future. Economy is about working and doing business to earn money. It is also about how we manage and use the money to buy goods and services. When people are buying a lot and businesses are getting richer, the economy is said to be good. There is no limit to the things people want, but the money to buy those things is usually limited. If every household in the country could produce every-thing they wanted, our lives would be much simpler. But all of us need to buy things or services from each other. To do this, we have to earn an income. A doctor, for example, earns money by treating patients. If there’s a leaking water pipe in the house, the doctor would pay a plumber to fix it. If food is needed it will be bought from the grocery shop. 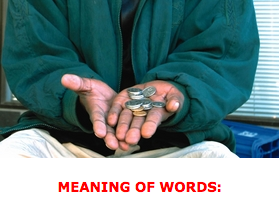 Even people in the informal economy, like street sellers, sell and buy among each other. Economy is all about earning money and how we use and manage our money to buy goods and services. Managing your money means using it wisely. The amount of money you earn, for example, will help you pay for your basic needs like food, housing and clothing. If there is money left, you can spend it on non-basic items like a TV set or a car. Or you can open a savings account at a bank to save money for your children’s education or your retirement. Based on your earnings and future earnings, you can also spend money before you actually have it. It means you can buy things on credit by borrowing money from the bank or shop where you buy the product. But to get credit, you must prove that you will be able to pay back the money over an agreed period of time. Most people who buy a house or a new car can only afford it on credit. Credit makes it easier to buy things, but it is more expensive, because you have to pay interest on the money you borrow. Just like you have to earn and manage your money, government also has to earn money and use it wisely. Government is responsible for growing the country’s economy and improving the general standard of living of the people. A large share of our country’s money comes from the taxes we pay and from exporting products to other countries. Exports include gold, iron, steel, coal, fruit, fish and vegetables. To help government decide how best to spend the country’s money, a budget is drawn up every year. The Expanded Public Works Programme is an example of how government spends money to help people to get jobs and skills. This reduces unemployment and poverty. Tax money is used for things like healthcare, education, housing, roads, railways, harbours, and safety and security. These things help to create a better life for all South Africans. Taxes: Money collected by government from people or businesses for use in public spending like health, education, transport and housing he study also found that the country is likely to meet the targets of the Accelerated and Shared Growth Initiative for South Africa. These targets include halving unemployment, creating jobs and growing the economy by six per cent by 2014. WHAT IS THE MICRO ECONOMY? The economic activities between you and your bank, or between you and someone who provides a service, like a doctor or a plumber, are at the micro level of the economy. This means they are small economic activities. Even though micro-economic activities are small, they are an important part of the country’s overall economic performance. If we buy too much on credit, the prices of goods go up, which is one of the things that cause inflation. Government then steps in and raises the interest rate. This means we pay more interest on borrowed money. It should encourage us to use less credit and buy only what we can really afford. Government also gets involved in micro-economic issues when the prices of goods we import from other countries, go up or down. When the oil price goes up, for example, it affects the country’s economy. South Africa does not produce oil, but buys it from oil-producing countries. Petrol is a product of oil, so when those countries raise the oil price, our government has to raise the petrol price in South Africa. 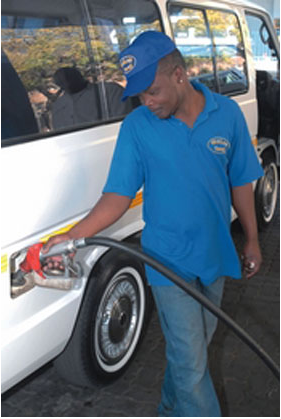 The petrol price influences the prices of many other things, because petrol is used to transport goods and people. To buy oil, government has to use foreign money like dollars. Some ways in which the country earns foreign money, is from export duties and foreign investments. If we do not have enough foreign money, government cannot protect us from price increases. Eleven years ago, Hosea Moutlane was just a youngster thinking about his future in the dusty streets of a small village outside Polokwane in Limpopo. He had passed his matric, but didn’t have money for further studies. Moutlane found a job as a security guard in Lephalale (previously Ellisras), but this was not really what he wanted to do. When he later got a job as assistant to a baker, he became interested in baking as a career. In 2006, Moutlane visited the Lephalale Community Library where he found a copy of Vuk’uzenzele. A story in the magazine about how to draft a business plan caught his attention. This, and a competition he saw in the local newspaper, changed his life forever. The Limpopo Youth Buzz Competition, run by the Provincial Department of Economic Development, called for the youth to draft a business plan. 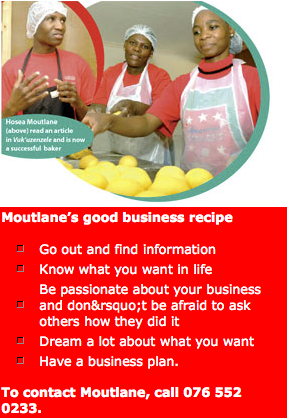 Aimed especially at previously disadvantaged youths and those who wanted to start businesses, it was a golden opportunity for Moutlane to get his own bakery going. Using the tips he saw in Vuk’uzenzele, Moutlane drafted a business plan. His efforts paid off and he was called to present his plan. Chosen as one of five winners, his prize was R192 000 worth of equipment to start a bakery. The department also helped him with training in business skills like financial management, tendering skills, book-keeping, business management and life skills. He found space for a business in Modimolle (previously Nylstroom) and started his bakery in February this year. Six people from the local community are working for him. “We bake things like bread, bread rolls, rusks and cakes. We sell to the community and deliver to different shops,” he said. The business is doing much better than Moutlane ever thought it would. “It is the only bakery in the area and a lot of people buy here. We can hardly keep up with the demand,” said the successful young businessman. “This business has taught me to be responsible and take care of other people. I give bread to the needy every Friday and some come here every day. I also buy newspapers and magazines so those who don’t have access to information can read them for free at the bakery,” he said.